DJI’s Osmo Mobile gimbal has been hugely popular since it was first released. But, one thing that gave the competition so much advantage was its cost. Being released at $299, the $150 or less alternatives were much easier for customers to swallow. DJI’s first answer was to drop the price to $199. But now they’ve have answered that price difference again with the new Osmo Mobile 2, at a mere $129. The specs for the new gimbal look quite good, although I’m curious how it’ll compare to its predecessor. The Osmo Mobile 2 is a little larger, but lighter than the Osmo Mobile. The battery runs on a lower voltage, dropping from 11.1v to 7.4v, but has a much higher capacity. Overall, it’s an increase from 10.8Wh to 18Wh. The gimbal itself also draws less power, with consumption dropping from 2.5W to 1.2W. This means that, in theory, you’d get about 4 hours of use with the original Osmo Mobile, where you’d get closer to a theoretical 15 hours with the Osmo Mobile 2. That 15 hours is what DJI claim, too. It supports phones that are between 58.6 to 84.8mm thick. This covers just about everything in size from the iPhone SE up to the iPhone X, as well as most popular Android phones. You are able to mount that phone in both horizontal or vertical orientation, too. This will come in very handy for those Snapchat and Instagram Stories videos. The Osmo Mobile 2 communicates with your phone via bluetooth, allowing you to start and stop recording, switch between front and rear cameras, or even zoom. It also contains features such as timelapse, motionlapse, hyperlapse and slow motion video recording. Another big change that comes with the Osmo Mobile 2 is that it now uses an internal battery. Assuming it doesn’t have the performance degradation of iPhones, it should make life much easier, especially given how long it lasts. Personally, though, I get a good few hours out of my Zhiyun Smooth-C gimbal, but I still take 3 spare sets of batteries with me whenever I leave the house with it. 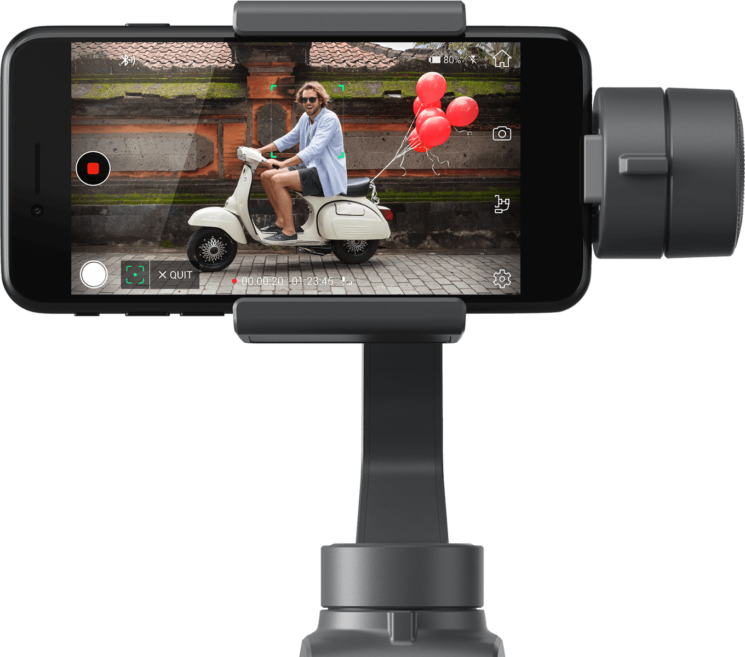 The DJI Osmo Mobile 2 is expected to ship next month, and pre-orders will open up on January 23rd. Initially, it’ll be available exclusively through the Apple Store, and then presumably through the usual places shortly thereafter. You can find out more about the DJI Osmo Mobile 2 on the DJI Website. The new Ronin-S is a scaled up version for DSLRs and mirrorless cameras, similar to something like the Zhiyun Crane 2. There isn’t much information about this one yet, and no specs have been published with regard to load capacity, etc. But we’ll be sure to keep you posted. There’s no information on price or expected release date for the Ronin-S yet, but a couple of neat features are mentioned on the website. For a start there’s a dedicated follow focus unit. Hopefully, like the Crane 2, that should at least be compatible with Canon. I know it’ll win quite a few people over if it’s also compatible with Panasonic and Sony bodies. Again, not confirmed, but it will be a big win for DJI. The Ronin-S offers support for several addons, including microphone, LED lights, wireless video transmitter, dual handle support, and various other devices. No doubt support for the Osmo Mobile 2 will be added to Filmic Pro fairly quickly, for those of you who use it. As mentioned, no word on price or release date, but we’ll update as we hear more. You can find out more about the Ronin-S on the DJI website. « Photographers! Do NOT Fake it till You Make It! DJI are kill it. Great product with regular updates. The gimbal and drone markets are advancing so fast. It’s kinda hillarious the extent DJI went to copy the Zhiyun Smooth Q… guess they had to move quickly not to lose the market. Everything from battery life, not having a sideways mount, not having a trigger, the control scheme, the price point, the clamp system, port for charging your smartphone… it’s so obvious how much DJI was trying to burry the Smooth Q that it’s kinda irksome. Very bad for Zhiyun though. They don’t have the name, ergonomics is on the DJI side, but most importantly, DJI just has the better app. And I imagine it’ll be very very hard for Zhiyun to compete on that side… DJI’s app draws from their excellent development team that works on the drone side. Just a couple of months I got myself the Smooth Q… I’d definitely go for Osmo Mobile 2 now if I could. Alas, too late.